Rwanda is a small and linguistically homogeneous country and easy to control. Since pre-colonial times, Rwanda has always been politically highly centralised. Rwandans also tend to listen to their leaders, a social phenomenon that helped the genocide unfold in 1994. The most important human rights problems are government harassment, arrest, and abuse of political opponents, human rights advocates, and individuals perceived to pose a threat to government control and social order; security forces’ disregard for the rule of law; and restrictions on media freedom and civil liberties. Due to restrictions on the registration and operation of opposition parties, citizens did not have the ability to change their government through free and fair elections. There were reports military intelligence personnel employed torture and other cruel, inhuman, or degrading treatment or punishment to obtain confessions in military detention centers. There were no reported prosecutions of personnel for torture. There were numerous reports police at times beat newly arrested suspects to obtain confessions. Unregistered opposition political parties reported authorities frequently arrested their supporters and party officials but released most after detention of one week or less, although several, completed longer detention. Opposition leaders and government critics faced indictment under broadly applied charges of genocide incitement, genocide denial, divisionism, and incitement to rebel. Numerous individuals identified by international and domestic human rights groups as political prisoners remain in prison. Although the constitution and law prohibit such actions, there were numerous reports the government monitored homes, movements, telephone calls, e-mail, other private communications, and personal and institutional data. There were reports of government informants working within international and local NGOs, religious organizations, and other social institutions. After its military victory in July 1994, the RPF organized a coalition government called “The Broad Based Government of National Unity.” Its fundamental law was based on a combination of the June 1991 constitution, the Arusha Accords, and political declarations by the parties. The government outlawed the MRND Party. In April 2003, the transitional National Assembly recommended the dissolution of the Democratic Republican Party (MDR), one of eight political parties participating in the Government of National Unity since 1994. Human rights groups noted the subsequent disappearances of political figures associated with the MDR, including at least one parliamentarian serving in the National Assembly. On May 26, 2003, Rwanda adopted a new constitution that eliminated reference to ubwoko and set the stage for presidential and legislative elections in August and September 2003. The seven remaining political parties endorsed Paul Kagame for president, who was elected to a 7-year term on August 25, 2003. Rwanda held its first-ever legislative elections September 29 to October 2, 2003. A ninth political party formed after these 2003 elections. In the spring of 2006, the government conducted local non-partisan elections for district mayors and for sector and cell executive committees. Elections for the Chamber of Deputies occurred in September 2008; the RPF won an easy victory in coalition with six small parties, taking 42 of 53 directly-elected seats. As provided in the constitution, 24 seats were also accorded to women candidates in indirect elections. Women now hold 45 of the 80 seats in the Chamber. The elections were peaceful and orderly, despite irregularities. A tenth political party formed in 2010. 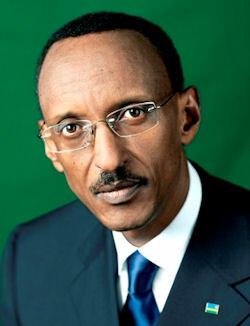 Presidential elections were held in August 2010; the National Electoral Commission reported that President Kagame won re-election with roughly 93% of the vote. The presidential election was peaceful and orderly, with heavy turnout. However, the pre-election period was marked by events of concern, including waves of terrorist attacks using grenades in populous areas, the murder of a journalist, the unexplained murder of the vice president of the unregistered Democratic Green Party, an assassination attempt on a former high-ranking government official accused of fomenting attacks, and the suspension of two local-language newspapers. In addition, two political opposition figures were arrested on criminal charges, and a party that had been seeking to register for many months was unable to do so. Local elections again took place in the spring of 2011, with indirect Senate elections following in the fall. Both elections were peaceful and orderly. RPF candidates again dominated the field.